Tennessee (Thomas) Williams was born on March 26, 1911, in Columbus, Mississippi. His family moved to St. Louis in 1918 and he spent the next 20 years of his life there. Although he reflected fondly on his childhood years in Mississippi, life took a negative turn for him and his family in St. Louis. His father’s alcoholic tendencies and irresponsible spending led to a chaotic lifestyle of constant motion. Williams’ father often squandered family money, forcing them to live in a variety of crowded, rented rooms. Hostility between his parents was palpable as his father’s behaviors became increasingly destructive. The unrest of his family life in St. Louis lead Williams to resent the city. Despite his eventual exodus, his writing reflects this spirit of discontent that took root there. Never quite at home, he continually longed for a simpler time and place. Williams left St. Louis in 1929 to attend the University of Missouri. His father soon withdrew him from the school when he learned that his girlfriend was also a student there. He returned home discouraged and worked as a sales clerk for a shoe company. This job drove him into depression and he turned to his writing, seeking respite in poetry and stories. He eventually suffered a mental breakdown and escaped to Memphis. After recovering in Memphis, Williams returned to St. Louis and formed relationships with several poets at Washington University. He graduated from the University of Iowa in 1938 and moved to New Orleans the following year. There, he began to write, desperate to put his unpleasant adolescent memories behind him. Commercial success followed soon after and his plays were met with critical acclaim, leading him to earn a Drama Critic’s Award and his first Pulitzer Prize. Williams never fully escaped the inner demons that seemed to take root in St. Louis. Although he directed much of his frustration toward the city, problems of alcoholism and depression followed him wherever he went. In the 1960s, he struggled with his writing and went to rehab at Barnes Hospital in 1968. Upon his release, he began writing again and wrote several new plays as well as “Memoirs,” published in 1975, which told the story of his struggles and afflictions. His unrest, though a source of strife, arguably fueled his creative genius and led to his success as a playwright. He died in 1983 and was buried in Calvary Cemetery in St. Louis, despite his open resentment toward the city and the memories formed there. 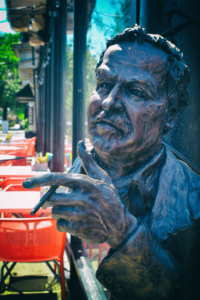 Tennessee Williams’ bust sits on the southeast corner of Euclid & McPherson. You can learn more about the Central West End’s Writer’s Corner Project here.